I just found out that Evel Knievel, the greatest Dare-Devil in the history of mankind, died today. 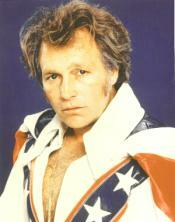 If you were a child of the 70s and 80s (like me), then you know that there is only one #1 and that's Evel Knievel. Here are some you-tube clips of his awe inspiring feats and crashes. Hey Man, Dig Those Krispies! Dave Says "Thank You, Drive Through"
Here's a classic clip from The Late Show with David Letterman with Dave running the drive through at McDonald's. Enjoy!